OMIGODYOUGUYS Somehow, allez! gourmet, my beloved little hobby blog (hobblog? ), has been visited over FORTY THOUSAND times and today marks my HUNDREDTH post! I started the blog in January 2012 as a new year’s resolution to share recipes on a regular basis, which I’d previously been doing via Facebook. Sharing on FB was neither pretty nor enjoyable. Remember Notes? Ew. Realizing how much I loved to write about cooking and food, I thought I’d better give a proper blog a try. I’m so glad I did! I have had so, so much fun working on a!g. Posting has been an exciting challenge, inspiring me to try new recipes and put my voice out into the great unknown. Putting myself out there was an intimidating prospect! “Who will read this?” I wondered. “Will anyone find it? Will my blog have critics?… Is this thing on?” Mysteriously, the interwebs worked their googly magic and people other than my mom started visiting the blog, unprompted. allez! gourmet’s biggest hit by far has been 2013’s peanut butter & cinnamon greek yogurt dip. It’s probably the simplest recipe I’ve posted and it’s viewed over 100 times a day. A day. Crazy! So, instead of learning from the peanut butter dip’s lesson that readers love simplicity, today’s 100th post is multi-stepped (but quite representative of my kitchen). Ha! Enjoy and, as always, thanks for reading! This is a classic vegan grain and veggie bowl. Make the grain, boil veggies, cook the tofu, then toss it all with a raw and incredibly flavorful dressing. You will feel healthier just by smelling this stuff. Prepping the dressing is the best part of this meal: add all dressing ingredients to a blender or food processor, and blend until smooth. Voila! Set aside. If you’d like the peanuts to have a bit more oomph, toast them in a skillet first. On to the quinoa. 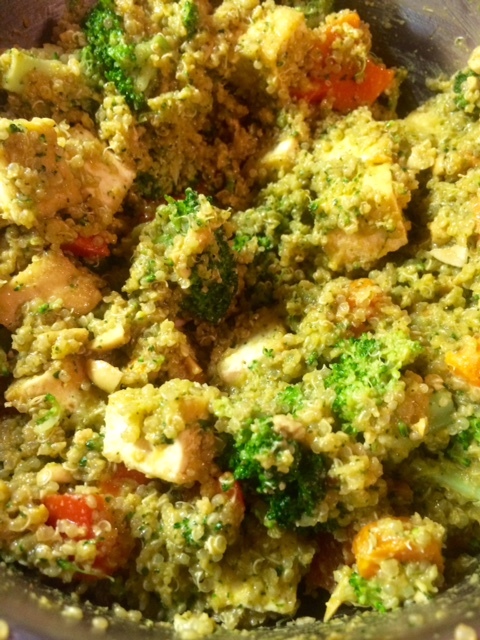 As the quinoa cooks, you’ll have plenty of time to par boil the veggies and cook the tofu. In a saucepan fitted with a lid, add the quinoa, water and base or broth, can of coconut milk, and salt. Bring to a boil, then reduce heat and simmer over medium low for 20 minutes. Stir this once or twice as it cooks. While the quinoa bubbles along, dice the tofu and set the chunks on a plate lined with paper towels to drain a bit. I put two paper towels under the tofu blocks and one on top, which absorbed a good amount of excess moisture. Chop your veggies as the tofu drains. In a deep saucepan, heat the coconut oil over medium high. When hot, add the tofu chunks in a single layer, and cook for about 3 minutes before flipping. Flip each piece over and cook another 3 minutes until the tofu is a pretty golden-brown color. Remove the cooked tofu to the same plate it was on earlier, lined with a clean paper towel, salting the tofu to taste. 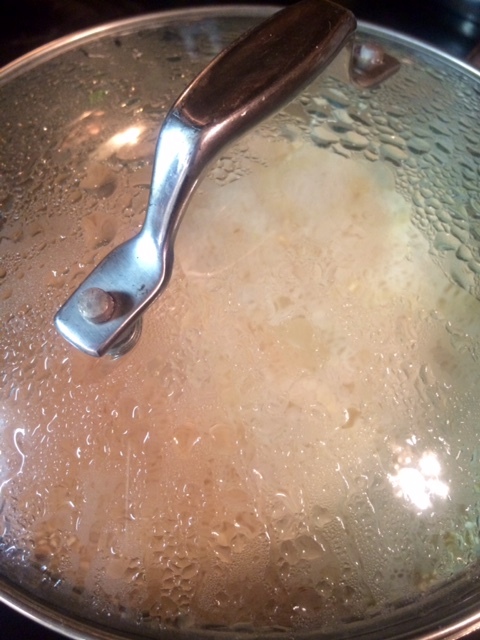 Add hot water to the saucepan you cooked the tofu in (no need to clean it out- hooray!) and bring to a boil. Add the red bell pepper, broccoli, and carrots, and boil for 3 minutes. Drain the veggies in a colander when three minutes is up. All done! Now to mix it together! 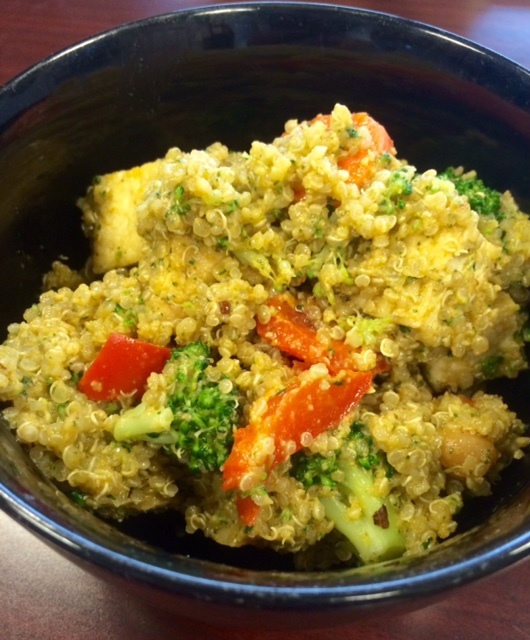 In a large mixing bowl, mix the quinoa, drained veggies, and dressing. Fold in the tofu blocks and garnish with scallions, cilantro, or additional chopped peanuts… and serve. Delicious! A complete meal in one dish. This yummy bowl is fabulous hot and works at room temperature as well, making great picnic or packed lunch fare. The meal was so tasty, I didn’t take any photos of my plate. Instead, enjoy two unrelated fall-themed pics from last night. November is in full swing! Thanks again for reading, and I raise my pumpkin ale to you! This entry was posted in Easy, Gluten free, Healthy Spin, Vegan and tagged coconut quinoa, quinoa veggie bowl, spicy coconut quinoa, thai quinoa, thai veggie bowl, vegan dinner, vegan lunch, vegan quinoa bowl. Bookmark the permalink. WOW! My blog is blushing! You are one kind Momofuku!! And not at all biased. 😉 Thank you, thank you for the support. 100 Posts?!? Woweee gal, good work! This inspires me. Great work! Lauren,Congrats on 100 posts! Your writing is almost as dynamic and interesting as you are. I love this recipe except for the tofu. Any concerns about the “genetically-modified to resist Roundup” aspects of the soy in tofu ?(http://theskepticalcardiologist.com/2014/08/09/tofu-heart-healthy-superfood-or-environmental-nightmare/). Is there a reason you would choose tofu instead of, say shrimp? I’m just trying to understand the mind of a tofu user who is not a vegetarian :). The reasoning was simple- Dave requested it. 🙂 We both enjoy the texture of tofu and enjoy it infrequently. And yes, I much prefer shrimp! Thank you for the encouragement, too!